On 27 September the Aviation Weather Unit in Alaska received a pilot report of a minor eruption of ash and steam at Gareloi. The plume reportedly rose to 1,500 m altitude but was not visible on infrared satellite imagery suggesting it may have not ascended that high. As late as 5 December AVO had learned of no further sightings of activity at Gareloi. Information Contacts: NOAA/NESDIS Satellite Analysis Branch (SAB), Room 401, 5200 Auth Road, Camp Springs, MD 20746, USA; Alaska Volcano Observatory (AVO), a cooperative program of a) U.S. Geological Survey, 4200 University Drive, Anchorage, AK 99508-4667, USA (URL: http://www.avo.alaska.edu/), b) Geophysical Institute, University of Alaska, PO Box 757320, Fairbanks, AK 99775-7320, USA, and c) Alaska Division of Geological & Geophysical Surveys, 794 University Ave., Suite 200, Fairbanks, AK 99709, USA. The Global Volcanism Program has no Weekly Reports available for Gareloi. During an overflight on 8 August, USN pilot Edwin Beech saw vapor rising to about 1 km above the summit crater. The next day, a Northwest Orient Airlines pilot observed a steam and ash column that reached 10.5 km altitude and was blown NNW, away from inhabited areas. Poor weather obscured the summit for the next several days, although large eruption columns would have been visible above the cloud layer from passing aircraft. On 13 August, USN pilots were able to see the top 300 m of the volcano. A light gray eruption cloud that appeared to originate from the NE quadrant of the summit crater rose to about 2.5 km altitude (1 km above the summit), depositing ash to the NW. Both Lt. Beech and David Evans, who operates the USGS seismic station on nearby Adak Island, felt that the summit area had changed significantly during the eruption. By 23-24 August, the activity had declined to weak vapor emission. No lava flows have been observed. Gareloi's last reported eruption was in January 1952. Information Contacts: T. Miller, USGS, Anchorage; Lt. E. Beech, U.S. Navy, Adak Island; D. Evans, USGS, Adak Island. USAF pilot Jerry Nelson observed renewed activity from Gareloi during an overflight on 17 September. As he approached the volcano at about 1600, he saw a slight wisp of vapor that grew rapidly into a dark brown ash-rich column reaching about 6 km altitude. The eruption column, which appeared to originate from the E side of the summit crater, drifted slightly N or NW. The activity was visible until Nelson left the area about 10 minutes later. Information Contacts: T. Miller, USGS, Anchorage AK; J. Nelson, U.S. Air Force, Travis AFB, CA. On 10 and 11 August, SO2 from a fresh volcanic plume was detected from a research aircraft (flown by NASA under contract from the U.S. Department of Energy) at 19.2 km altitude just S of Anchorage Alaska. Imagery returned 8 August at 1010 by the NOAA 6 satellite shows a high-altitude plume appearing to originate from the vicinity of Gareloi. Using a drift rate of 30 km/hour, Los Alamos National Laboratory (LANL) personnel calculated that the eruption that produced this plume had probably ended about 10 hours earlier. Later visual and infrared images show the plume moving toward the Anchorage area, about 2,000 km from Gareloi, at a rate that could have brought it to the sampling area by 10 August. The eruption column seen emerging from Gareloi 9 August by a commercial pilot was also present on satellite images, but clearly was not large enough and did not reach a high enough altitude to have been the source of the material sampled 10-11 August. Wind conditions also preclude the 7 August eruption clouds from Mt. St. Helens as a source for SO2 in the Anchorage area at this time. Further Reference. Sedlacek, W.A., Mroz, E.J., and Heiken, G., 1981, Stratospheric sulfate from the Gareloi eruption, 1980: contribution to the "ambient" aerosol by a poorly documented volcanic eruption: Geophysical Research Letters, v. 8, p. 761-764. Information Contacts: W. Sedlacek, G. Heiken, and E. Mroz, LANL. Infrared imagery from the NOAA 7 polar orbiting satellite 15 January at 1402 showed an apparent eruption cloud blowing E from the vicinity of Gareloi (figure 1). Analysis of this image yielded a cloud top temperature of -36°C, indicating an altitude of 7-9 km. No eruption clouds were present on images the two previous days and the following day, nor was any activity evident on imagery 24 January, or 3 and 11 February. No ashfall was reported on Adak Island (130 km to the E) or Shemya Island (500 km to the WNW). Navy pilots plan to photograph Gareloi in the near future, for comparison with photos taken during and after its August-September 1980 eruption. Figure 1. Infrared image returned 15 January 1982 at 1402 by the NOAA 7 polar orbiting satellite. A bright white plume, at left-center, drifts ESE. Dark ripples near the plume and at right-center indicate the position of islands in the Aleutian chain. The seismic network on Adak Island recorded an mb 3.2-3.3 earthquake on 15 January at 0521. No unique hypocenter can be determined for this event, but one of the two possible solutions places it directly under Gareloi. This shock was substantially larger than the mb 2.6 event that accompanied the February 1974 eruption of Great Sitkin, which produced a 3-km plume. Additional events were recorded the following week that may also be centered in the vicinity of Gareloi. An infrasound array at College, Alaska (about 2,200 km NE of Gareloi) recorded no acoustic wave associated with the eruption. Information Contacts: J. Kienle, Univ. of Alaska; S. Billington, NOAA/CIRES, Univ. of Colorado; P. Mutschlecner, LANL. On 4 September 1987 at 1500, flight engineer George Wooliver (Reeve Aleutian Airways) observed a narrow flow-like feature that had descended the E flank, from the N crater rim at 1,500 m elevation to at least 1,100 m. A thick cloud cover obscured it below that level. Steam was rising as much as 100 m above the flow feature along its entire visible length. Steaming from the crater appeared more vigorous than usual. The 8 x 10 km Gareloi Island, the northernmost volcano of the Delarof Group at the western end of the Andreanof Islands, consists of a stratovolcano with two summits and a prominent SE-trending fissure. The fissure was formed during an eruption in 1929 and extends from the southern summit to the sea. Steep sea cliffs that are cut into rocks of an older, eroded center are found on the SW coast, and submarine deposits of three debris avalanches produced by edifice collapse are found offshore. 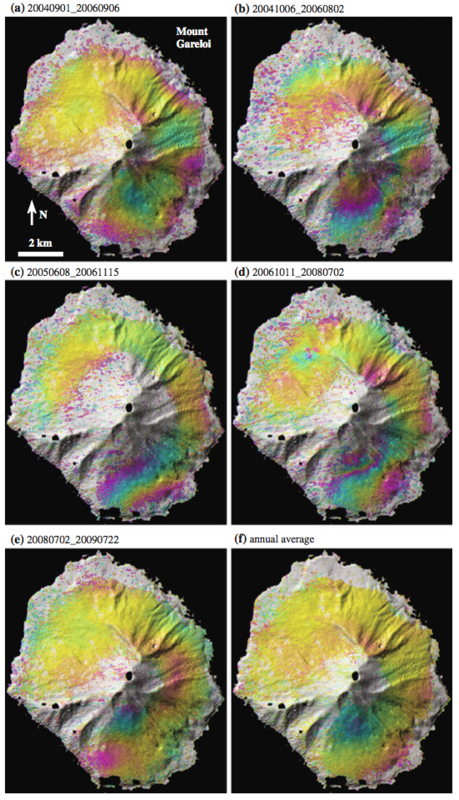 Young lava flows cover the older volcano from the summit to the coast along three broad axes trending NW, ENE, and S. The 1929 eruption originated from 13 craters along a 4-km-long fissure. Phreatic explosions were followed by the ejection of glassy pumice, lapilli, scoria, and older blocks, as well as by the emission of four short, steep lava flows, one of which reached the SE coast. Coats R R, 1959. Geologic reconnaissance of Gareloi Island, Aleutian Islands, Alaska. U S Geol Surv Bull, 1028-J: 249-256. Remarks: Subsidence of the south flank near 1929 vent area is likely due to contraction and compaction of surface deposits. There is no Emissions History data available for Gareloi. Two peaks form the summit ridge of Gareloi volcano. The active NE-most crater (left) forms the high point on the island. A SE-trending fissure, formed during an eruption in 1929, extends from the SW-most summit (right) to the sea. The 1929 eruption originated from 13 craters along a 4-km-long fissure. Phreatic explosions were followed by the ejection of glassy pumice, lapilli, scoria, and older blocks as well as by the emission of four short, steep lava flows. Photo by Fred Zeillemaker, 1986 (U.S. Fish & Wildlife Service, courtesy of Alaska Volcano Observatory). 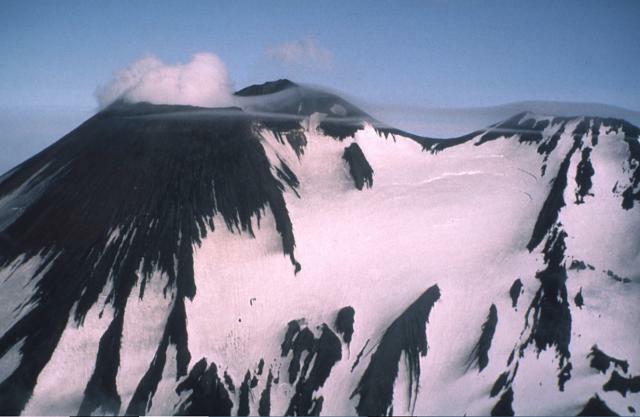 Gareloi Volcano in the western Aleutian Islands is seen from the south. Levied lava flows from a 1980s eruption drape the south flank of the southern summit crater. The white zone on the crater headwall is an extensive fumarole field. 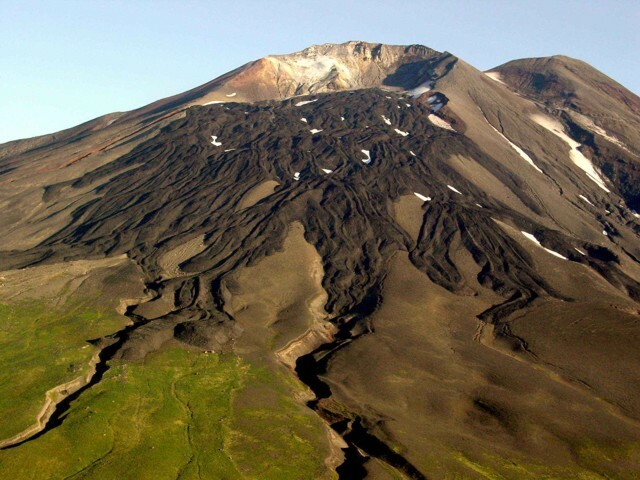 The 8 x 10 km diameter Gareloi Island consists of a stratovolcano with two summits and a SE-trending fissure. This prominent fissure was formed during an eruption in 1929 and extends from the southern summit to the sea. Photo by Game McGimsey, 2003 (Alaska Volcano Observatory, U.S. Geological Survey). The following 35 samples associated with this volcano can be found in the Smithsonian's NMNH Department of Mineral Sciences collections, and may be availble for research (contact the Rock and Ore Collections Manager). Catalog number links will open a window with more information. Large Eruptions of Gareloi Information about large Quaternary eruptions (VEI >= 4) is cataloged in the Large Magnitude Explosive Volcanic Eruptions (LaMEVE) database of the Volcano Global Risk Identification and Analysis Project (VOGRIPA).